PennsylvAsia: Love in the 1980s (1980年代的愛情), October 11 at Maridon Museum. Love in the 1980s (1980年代的愛情), October 11 at Maridon Museum. Gongmu township, central China, autumn 1982. After graduating from university, and as part of his "grassroots" government training, Guan Yubo (Lu Fangsheng) is assigned to the remote, mountainous township of the Tujia ethnic minority to work as its publicity/education officer. Xiang Yu'e (Li Shutong), his girlfriend from college, has to remain in the city. Yubo works directly under the mayor, whose current government challenge is to meet birth-control quotas. Feeling lonely, Yubo befriends an old cook, Tian, who used to be a teacher but whose career was destroyed by an anti-rightist campaign. 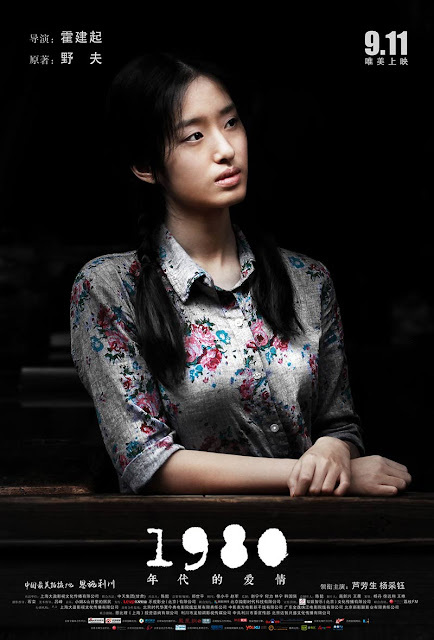 One day Yubo bumps into his secret first love from high school, Cheng Liwen (Yang Caiyu), who happens to be in the township working in a local shop. She's polite but uncommunicative. Unlike Yubo, she didn't manage to get into university, due to her family's political problems. Later, the two of them visit her father, who now lives alone in the mountains, making wooden birdcages. Gradually the two grow close but then, after six months, Yubo's term of service ends and it comes time for him to leave. The movie starts at 6:00 pm and is free and open to the public, though reservations are required to be made by phone: 724-282-0123. The Maridon Museum is an Asian art museum at 322 N. McKean St. in downtown Butler (map) that runs film series periodically throughout the year, in addition to art classes, book club meetings, and its regular exhibits.